The Duality of the Postcard and Kinenshashin, a photo by timtak on Flickr. 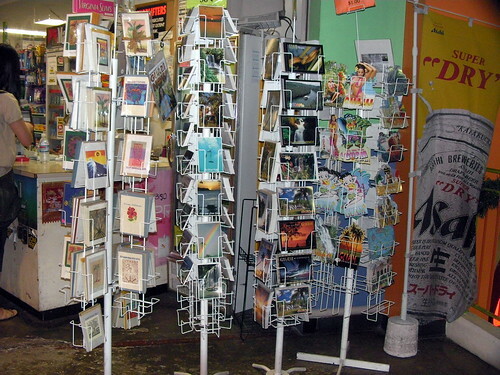 Wherever there is a tourism destination for Westerners, postcards are on sale. This destination (photo above) in Guam is no exception. Postcards are not for sale in Japan because the Japanese take photographs of themselves, a kinen-shashin, at tourism destinations instead of sending postcards. The difference is not between those who, embeded in their social groups, wish to have proof of their tourism experience and those that do not. This is the way that Nelson Graburn interprets the Japanese tendency to take "kinen shashin." Westerners are just as keen to have proof, in the form of a post card. We all want our bragging material, and in so far as we do want to tell others about our tourism experiences, we are all embedded in our groups. Postcards are almost always (Derrida's book "The Postcard" being an exception) sent to others, unlike "kinenshashin" which may or may not be shown to other peopole, so if anything it is Westerners who are embedded in their social structures. But these "bragging materials" or "proofs" are also self-consumed. The postcard and the kinenshashin are also self-confirmations. We all want to increase our self esteeem by integrating the exotic tousmism experience with the self-phenomenon (Metzinger) with which we identify. Those that identify with their self narrative have a desire to narrate themselves into the the real world on the back of a postcard which has an image like that shown on the front. Those that have a specular self "in the imaginary," want to have their photo taken in front of an image, a place, which has a name (meisho). Both have a dual use, and structure. The dual use and structure of the postcard and autophotography, reflects the dual motivation for the creation of self in the first place. We do it because we are narcissists - we want to love ourselves - and because we are lonely. The auto identiciation creates both a self and a shared world, the "real world." "The sage," mentioned in Nietzsches "History of an Error," Plato, did not just want to brag or pose and look sagely. He was also just plain lonely, he wanted to believe in a shared world of ideas, of "understanding." The Japanese sage, Nishida, (like Nenzi's floating world artist) also wants to believe in a shared world, of vision.